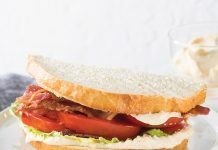 When it comes to classic Cajun dishes, couche chouche (pronounced coosh-coosh) might be foremost among them. 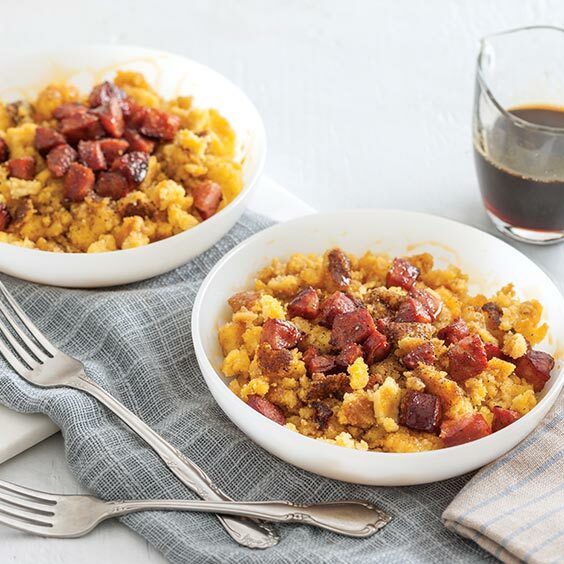 This rustic traditional Acadiana breakfast is typically served warm with cane syrup and a steaming cup of café au lait, but here we have added some crispy andouille sausage to liven up the mix. In a 10-inch cast-iron skillet, heat 1 tablespoon oil over medium heat. Add sausage, and cook, stirring occasionally, 10 minutes or until browned and crispy. Remove sausage with a slotted spoon, and reserve pan drippings. Remove pan from heat. In a medium bowl, whisk together remaining 1 tablespoon oil, cornmeal, sugar, baking powder, salt, 1 cup water, and milk. Heat pan drippings over medium high heat. Carefully pour cornmeal mixture into hot drippings. Cook 1 to 2 minutes or until a crust begins to form on bottom of batter. Using a wooden spatula, quickly scrape crust, and stir into cornmeal mixture. If crust sticks, sprinkle mixture with a few tablespoons of water. Cover, reduce heat to low, and cook 12 to 15 minutes or until tender, scraping crust occasionally. Mixture will resemble crumbled cornbread. 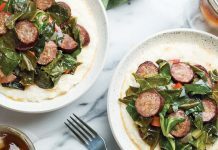 Serve with andouille sausage and cane syrup. This is great with crushed cracklin instead of sausage, as well. 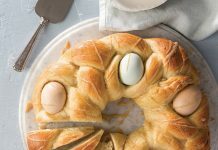 My grandaren’ts would make this with cracklin instead of Andouille Sausage and cane syrup to complete the finishIng touch. Yum yum. When make my Creole Cornbread Dressing I incorporate Andouille Sausage to bring a great flavor to my stuffing.